Funley's Big Mouth Bulletin for Promos & Updates! Chocolate Treats - Oh Natural! California school government guidelines - strictest in the U.S.
Our Famous Ingredients: Roll Over to Find out More! 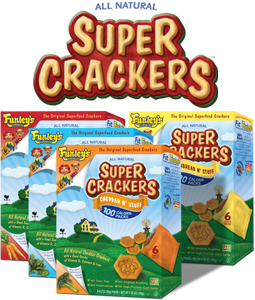 The Original Superfood Crackers.™ Taste is king at Funley’s Delicious. 100% natural with REAL ingredients, SUPER CRACKERS® wins taste challenges over leading brands and actually has nutritional benefits (including SB-12 School Compliance)! Pick your flavor, and feel free to add a comment below! Moe was hauling fresh crops of Superfood veggies on the Funley’s farm to the kitchen when he accidentally spilled some into a batch of Millie's famous cracker dough, resulting in a super delicious, wholesome new twist, ALL NATURAL SUPER CRACKERS. With Superfood veggies, vitamins and minerals hidden inside, you'd never know you were eating such goodness. The town is now crying for SUPER CRACKERS! Millie's two rules at Funley's Delicious: One, Moe keeps his mitts out of the batter, and two, all that comes from her kitchen must be ALL NATURAL, the best quality, DELISH, and fun to eat!